Cranberry Sauce - no turkey is happy to be seen without it, it is the classic combination. That does not mean you have to stick to the simple sauce, how about jazzing it up with a little spice and Port. 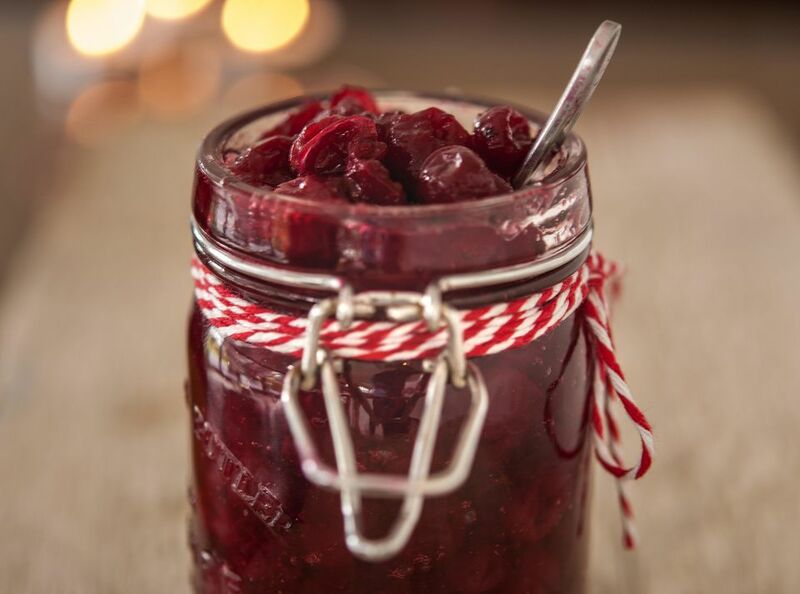 This Cranberry and Port Relish Recipe is another perfect accompaniment to not only your Christmas turkey, but works well with other poultry such as roast chicken and game. It will be happy to be served alongside a Game Pie and will be a stunning addition to your Boxing Day Buffet. Place all the ingredients except the Port into a roomy stainless steel saucepan (do not use reactive metal or copper as the vinegar will stain the pan). Bring the mixture to a gentle boil. Once boiling, turn the heat down and simmer gently, uncovered for 30 minutes. Keep an eye on the relish while it is cooking and stir occasionally making sure it does not burn. The sauce will gradually thicken and is ready when it thick but still has a good colour, over cooking this relish will caramelise the sugar and turn it brown. Remove from the heat before this happens. It is better a little runny than burnt. Pot the relish into your jars, cover with a clean sterilised lid and leave to go completely cold. The relish will keep well ln the pantry for several months and once opened it should be stored in the refrigerator. Serve the relish with your turkey and as mentioned above wth any cold meats or game pie. Notes: To quickly sterilize jars if you only need a few, fill washing up bowl or sink with boiling water, slowly lower the jars carefully into the water and leave for 5 minutes to heat through. Take care when removing them from the water and place on to a kitchen towel, not directly onto a work surface. Dry thoroughly then pot your relish into the jars. This method works very well if you only have to do a few jars and makes it less costly than heating the oven. You can also run them through the dishwasher if you are running a wash.